BASS EXPO 2014: Hi, my name is Simon Cassidy and I am pleased to introduce you to our range of guitars and basses brought to you by our small independent family business from the North of England. 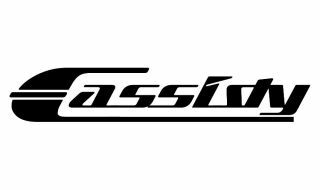 Our company Cassidy Music has developed out of my busy guitar teaching studio which has brought me into contact with hundreds of guitarists, offering me unique insights into that common guitarist affliction - 'gear acquisition syndrome'. All of our standard guitars are built to our design and specification in China where my eldest son Daniel is permanently based in order to ensure quality and consistency. I also make regular visits to China and make a point of personally inspecting all of our guitars and basses before they are shipped. They are then meticulously checked and set up by me when they arrive in the UK before being delivered to our customers. In addition to our standard range, we also produce a range of UK Custom Built guitars and basses. These are assembled by us in the UK using premium globally sourced products. We have made a conscious decision to deal directly with our customers in order to ensure consistent quality, excellent customer service and great value for money. If you buy one of our guitars you will be dealing with me personally - I look forward to hearing from you. When we were looking for the ultimate specification for our flagship bass certain features seemed obvious to us. First we would need the flexibilty and range of five strings. Then we asked for the responsiveness of active controls. Then the sheer beauty and the richness of tone and sustain provided by a through body neck. This is what we produced: the Cassidy CB901 5 String Active Bass. The Bluesville series BVB351 features a solid basswood body finished in hi-gloss, maple neck and fretboard finished in satin, plus a split PB style pickup, one volume and one tone control, traditional style bridge and open vintage style tuners all finished in chrome. The Bluesville series BVB361 features JB styling with solid basswood body, maple neck with rosewood fretboard, two JB style pickups, two volume and one tone control, plus traditional style bridge and open vintage style tuners all finished in chrome. For more information visit the Cassidy Music website, or connect with them via Facebook.